The following article is from the book Uncle John’s Heavy Duty Bathroom Reader. The Beats were America’s first hipsters. But what were they, like, really about, man? 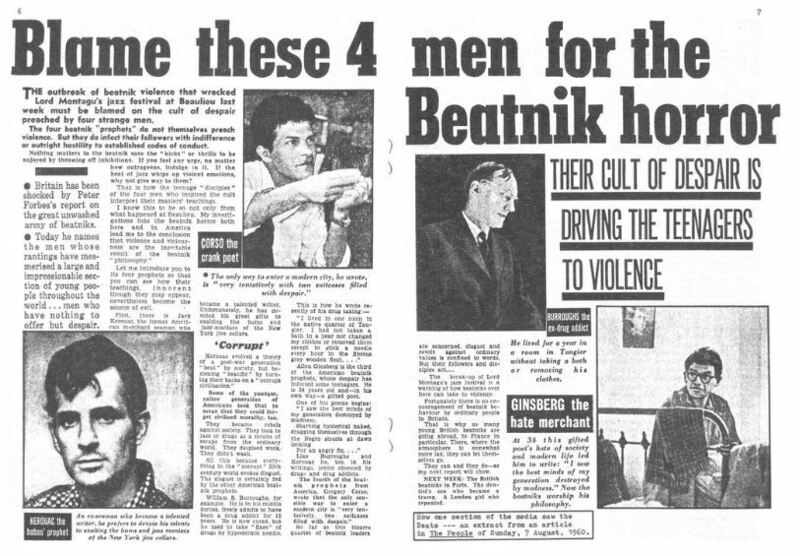 Holmes’ and Kerouac’s clique consisted of a handful of equally disenchanted artists, writers, and academics, all with (un)healthy interests in drugs, booze, and urban culture, including poet Allen Ginsberg and novelist William S. Burroughs. This was the Beat Generation, and they found their escape in the underexplored and often seedy side of American life. And they expressed it in what would come to be highly influential written works. The Beats thought the way to enlightenment and artistic fulfillment was to go out and experience the world, especially the fringe elements. They hitchhiked around the country, befriending (and emulating) hobos and outlaws (like Hunche), and they experimented with marijuana, Benzedrine, and morphine. The main core of the Beats ultimately settled in San Francisco’s North Beach in the mid-1950s, where they congregated at jazz clubs for smokey jam sessions and in coffee houses for poetry readings. The structure of jazz -it was experimental, non-linear, free-form, often stream-of-consciousness- heavily influenced the way the Beats wrote. And for just a moment I had reached the point of ecstasy that I always wanted to reach, which was the complete step across chronological time into timeless shadows, and wonderment in the bleakness of the mortal realm, and the sensation of death kicking at my heels to move on, with a phantom dogging its own heels. “Selling is more of a habit than using,” Lupita says. Nonusing pushers have a contact habit, and that’s one you can’t kick. Agents get it too. Take Bradley the Buyer. Best narcotics agent in the industry. Anyone would make him for junk. He is so anonymous, grey and spectral the pusher don’t remember him afterwards. * The Beat Generation set forth that it was okay to try new avenues in art, even if (or especially if) they were dark, unsettling, or personal. Artists sharing this philosophy included comedian Lenny Bruce, painter Jackson Pollock, photographer Diane Arbus, and filmmaker John Cassavetes. * Beat writers popularized spontaneous, stream-of-consciousness prose and performance art, along with abstract expressionism and postmodernism. Modern day “slam”-style poetry is a direct outgrowth of the Beats. So was the “New Journalism” or “literary nonfiction” of the ’60s and ’70s. Writers would deliver long, narrative, true stories (in which they were active participants) about the edges of American life as if it were a novel, in a highly-descriptive free-flow manner. Two of those writers: Tom Wolfe (The Electric Kool-Aid Acid Test), and Hunter S. Thompson (Fear and Loathing in Las Vegas). The article above was reprinted with permission from the Bathroom Institute’s book Uncle John’s Heavy Duty Bathroom Reader. Since 1988, the Bathroom Reader Institute has published a series of popular books containing irresistible bits of trivia and obscure yet fascinating facts.